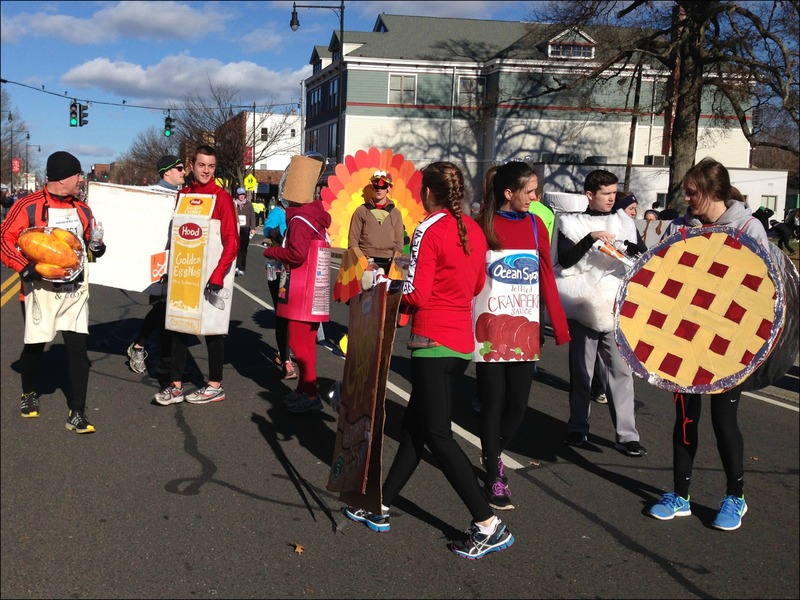 This year since we were doing Thanksgiving in Connecticut at my cousin’s house I decided to start the morning off with the Manchester Road Race (to learn more about the race check out my previous post HERE!). 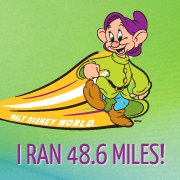 I had coordinated to drive there with Pam, a friend who I’ve met through running (who also works with my cousin!) and one of her other runDisney friends Kim. Thanks to Kim having done this race several times before she led us to some prime parking and even showed us to a warm, indoor place to hangout before the race start (which was awesome since it was quite cold!). …where we huddled close to stay warm and entertained ourselves by taking a bunch of pictures! Pam, Kim & I and a few of Kim’s friends! I had heard it was quite a crowded course (how could it not be with 15,000 people trying to squeeze through mostly residential streets! ), but there was a big hill towards the start of the race so I figured that would thin it out a bit. Pam and Kim were planning on using run/walk intervals and I was going to straight run, so we planned a place to meet at the finish and parted ways at the starting line. The course definitely ended up being more crowded than I was expecting and barely ended up thinning out at all until after the 3rd mile (of a 4.748 mile race). 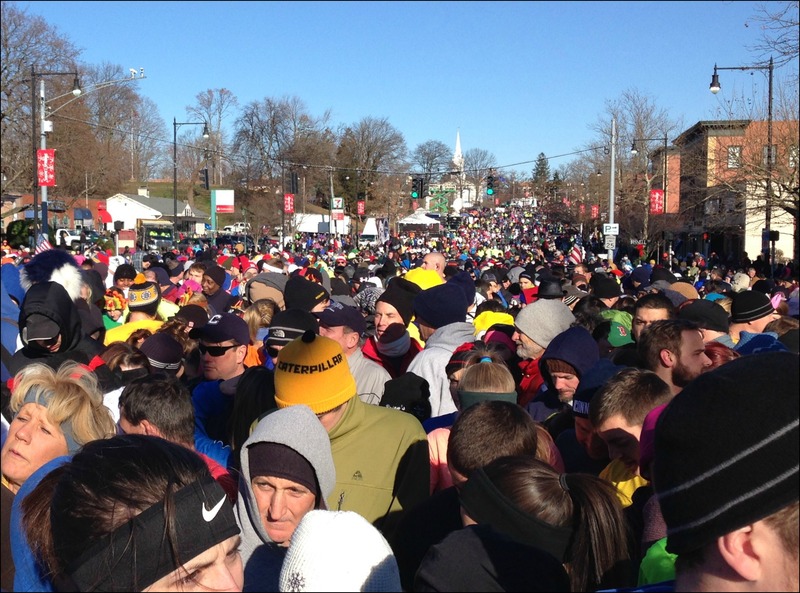 It’s not that I was trying to race or run for time or anything, but it’s actually quite difficult to “run”/ move in a tightly packed crowd like that without running right into the person in front of you. …and as soon as people crossed the finish line they threw on the brakes which caused quite a jam moving through the finish area. Crowds at the finish line! Overall the race was a good time. Almost all of the course was lined with spectators and Manchester residents whose houses are on the route were out in full force basically having parties on their lawn. There were A LOT of kids participating in the race, which was nice to see so many families out doing something active together before their Thanksgiving dinner. My only “warning” to anyone considering participating in this run in the future is that you shouldn’t expect to “race” it. 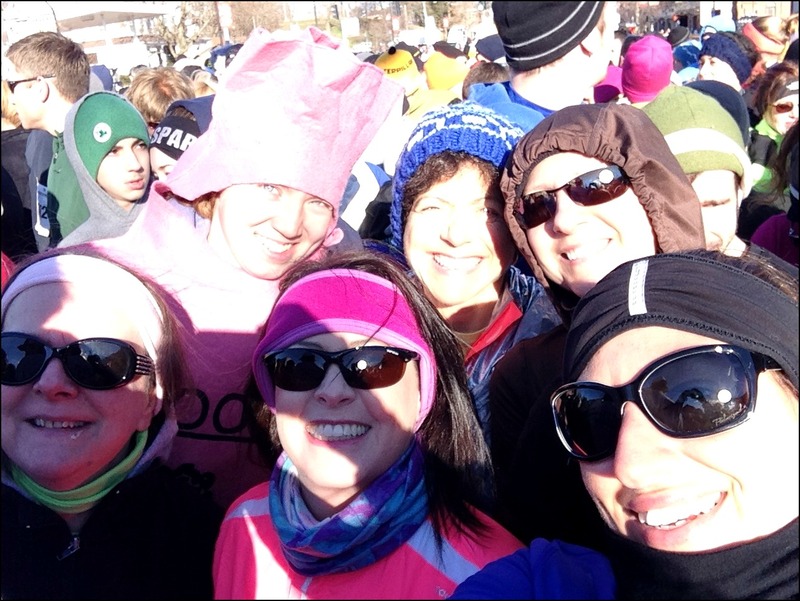 As I said the course was VERY crowded and I spent a lot of time trying to avoid tripping over kids who were either zig zagging all over the place, or just stopping in the middle of the run when they got tired – I was really worried I was going to plow right over one of them! I’m glad I got to experience this race at least once and it was nice to get out on Thanksgiving morning and go for a run with so many others! Plus it was entertaining looking at all the crazy costumes a lot of the runners had on, this group was one of my favorites – they were a full Thanksgiving dinner (this picture doesn’t even show them all!). 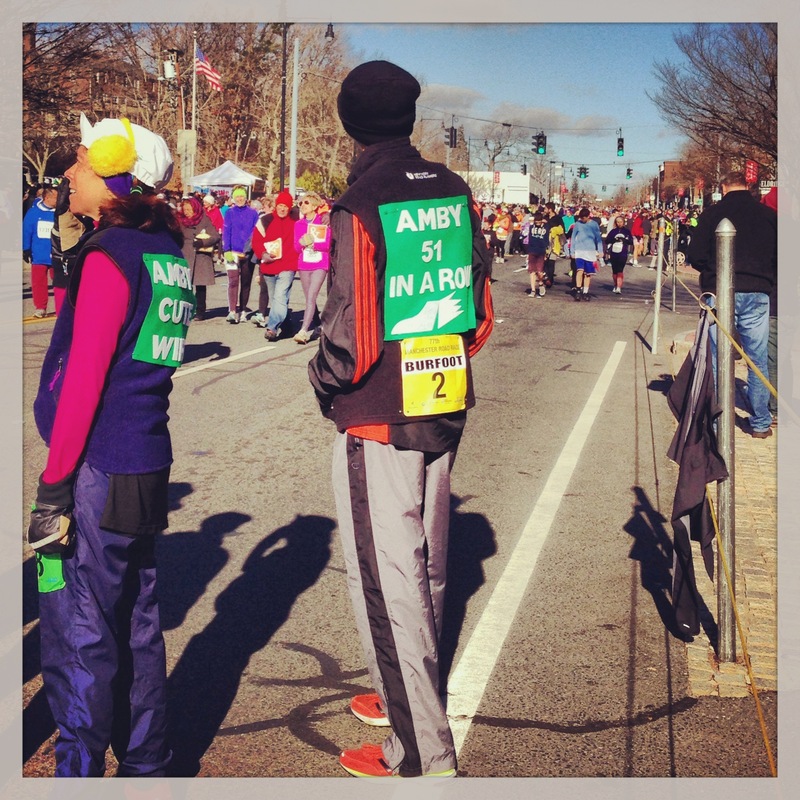 Oh, and on my way out I saw Amby Burfoot, who successfully completed his 51st Manchester Road Race in a row! You can read more about his record breaking streak on Runner’s World HERE. It’s such a small world 😉 I love Pam and Kim! Glad yall got to meetup. 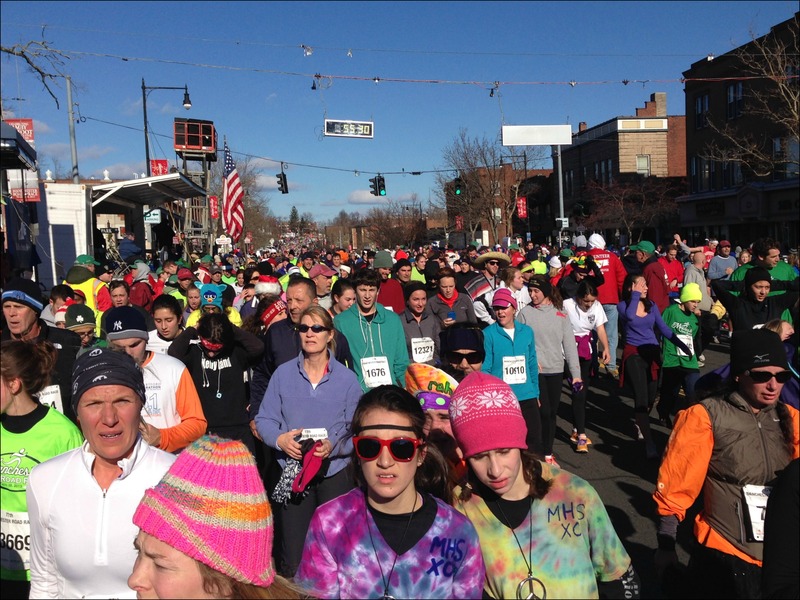 Turkey Trots are always so crowded but congrats on finishing! 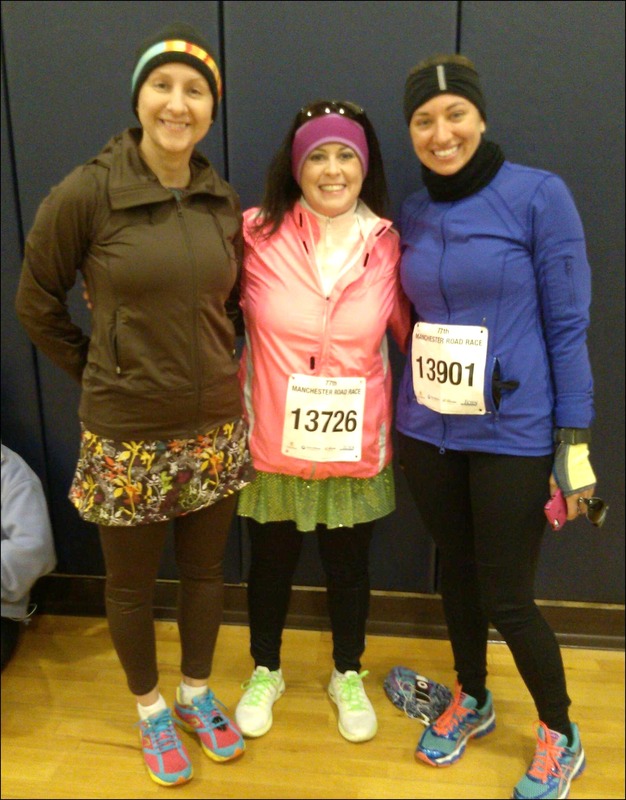 I opted out of the turkey trot and ran today. I figured Thanksgiving is one of the few days I can allow myself to be absolutely lazy, so I let myself be that until I headed out for the big meal. Good for you! I’m glad I did a Thanksgiving Day event at least once but I’m not sure I’d make it an annual thing. Wow – that was crowded!! I do like Thanksgiving morning races. And how fantastic you had someone who knew where the warm indoor place to hangout was!! I’m glad you were still able to match even though you had to wear a bunch of layers! I love Thanksgiving day races!